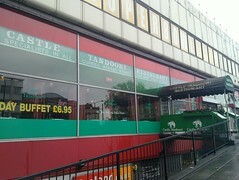 Indian restaurant on the second floor of Elephant & Castle Shopping Centre facing onto New Kent Road. They do both buffet and a la carte. secretlondon visited one Thursday evening in November 2008 and had the all-day buffet (£7) and a large bottle of cobra (£5). There were 12 choices of food in the buffet but it wasn't that exciting. It was quite dark and there was quiet background music. There were only two other people in at 7:15pm, but many more at 7:30pm. bob visited on a Thursday evening in June 2010. When I arrived at around 10pm there were a few customers still in. I went for the a la carte menu. I started with some really good meat samosas (£2.50) photo. They weren't the usual deep fried filo pastry type you find elsewhere. For my main course I had an OK goat bhuna (£6) photo, some pilau rice (£2.20) and some over-floured onion bhajis (£3) photo. Accessibility: There is step-free access and a ramp from street level. Level to the toilets. Last visited by bob, 10 June 2010. Last edited 2010-06-15 11:14:54 (version 9; diff). List all versions. Page last edited 2010-06-15 11:14:54 (version 9).